Lie back, relax and enjoy! 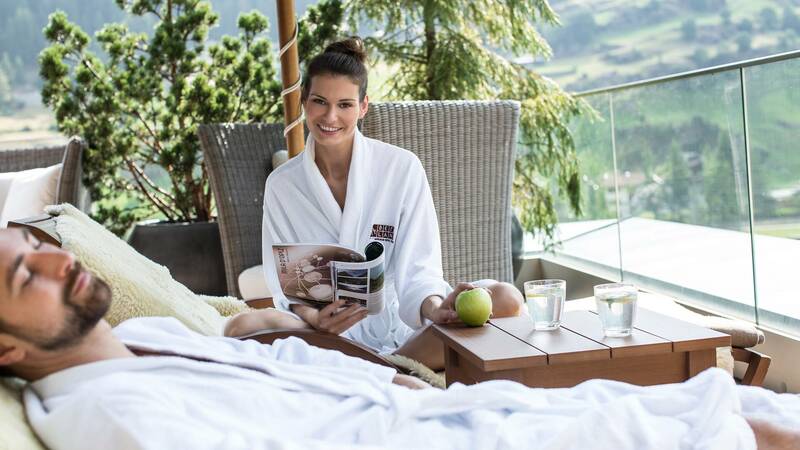 Book your appointment at the Sky Spa before you arrive and look forward to an unforgettable relaxation experience high above the pretty village of Sölden. Variant --- please choose --- 80 min Default 25 min 90 min 120 min 50 min 80 min 50 min 80 min 150 min, 3 x 25 min, single 75 min 80 min, Beauty Age 50 min, Beauty Energy Day Spa de Luxe incl. breakfast buffet in our hotel restaurant Day Spa Classic (*upon booking of a wellness treatment of your choice you will receive a € 10,- spa voucher) Day Spa Relax from 4 p.m. single 3 x 5 x colouring styling lashes and eyebrow colouring 50 min, Foot reflexology 50 min, Lymphatic drainage upper lip & chin armpit or bikini legs 16 min 24 min 75 min 50 min 50 min 50 min 80 min 80 min Default for 2 external guests 120 min 120 min, Private Sky Spa Romeo und Juliet 140 min, Private Sky Spa Alpine Heaven 80 min, Purity 110 min, Vitality 50 min, SKY SPA manicure or pedicure 25 min, Business manicure oder pedicure (shape & polish nails) 15 min, UV nail polish 25 min 50 min 80 min 50 min 50 min 100 min, Beauty Express 120 min, Relaxation pur 20 min, Chill-out massage 50 min, Young face treatment (extraction, concentrate, mask) 25 min, First manicure or pedicure 10 min, Colourful nails (*available from 9 a.m. - 2 p.m.
Let us know your needs and preferences - we will be happy to recommend a treatment.